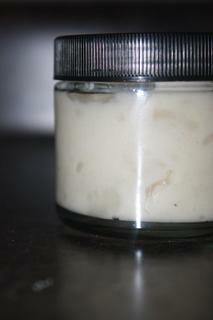 All-Natural Homemade Glue is a simple recipe to do along with your children that can keep for weeks in the fridge. My girls enjoy using it for all of their weekly art projects and I don’t get worried if my baby takes a taste or two! You simply mix 1 cup of flour, 1/3 cup of sugar, 1 1/2 cups of water (you might need a bit more or less) and 1 tsp of vinegar. 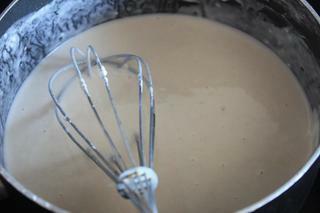 Then you warm it up on the stove till it thickens a little bit, let is cool and it is ready to use. 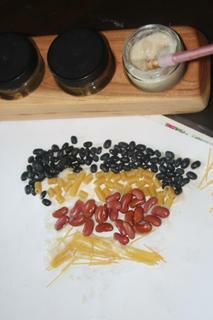 We make our “art masterpieces” with odds and ends from the pantry, broken pasta, dried beans or snack items that have gone stale. That way I don’t have to spend any money at the craft store and still have fun art projects to do with my children. I find it important to teach my children to reuse and reduce their carbon footprint in every way, even the little ones like art & craft projects. My daughter just will NOT eat sandwiches right now, so school lunches are a bit tricky to pack. Hates peanut butter with a passion too. 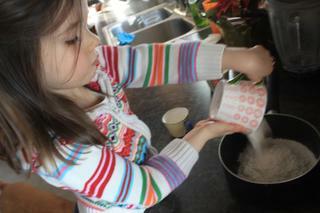 But a thermos with some leftovers from dinners she enjoyed works pretty well. We also include apple slices, and this week we had banana muffins that my daughter was utterly nuts for. Crackers of one sort or another often fill it out. She gets juice to drink, but at school is the only time she gets it. My kids love water and have a lot of it at home. Hi! Thanx for the great recipe. Am doing a craft club with the local kids, so this is eco friendly and economical!!! Wow, I thought I was a good parent by making sure my kids glue was non-toxic but….this just puts me to shame. Thanks for the great green ideas, I think this summer will be my lowest carbon footprint summer ever! Thanks for the helpful hints for kids crafts, my kids are almost out of school and I’ll need some fun ways to entertain them lest we all go insane from boredom. I guess my only concern with this process is that a container full of glue sounds like a ruined container to me. I don’t think using those throw away ziplock containers will help my footprint any. I guess I’ll just choose an older bowl and make it into my perpetual “glue bowl” so that I don’t use plastic container after plastic container. How strong is this glue? Is it permanent? I am making a sock puppet for my niece who is 7 months. Will this glue recipe work? linking up to this post tonight! Thanks for the great recipe. Do you happen to know about how long this lasts? Looking into making cardboard cat scratchers with kids for our local animal shelter, and wondering if this would hold together okay.